The trio, Ankit Anubhav, Shashank Srinivas, and Jashwanth Cheripally met while working at FXkart. 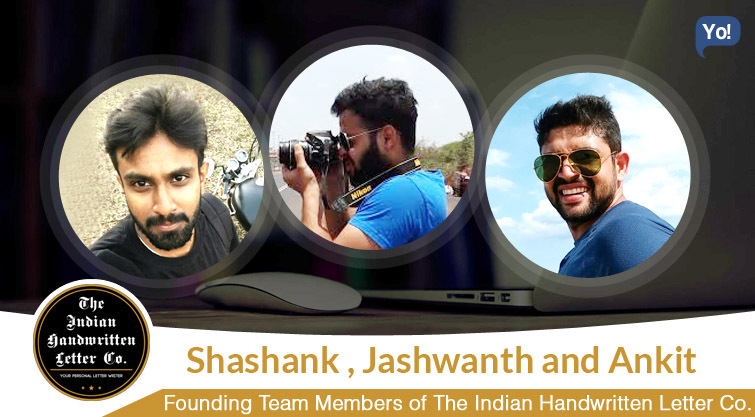 Ankit and Shashank belong to marketing background, whereas, Jashwanth is working as a software engineer. The trio’s passion for handwritten letters brought them together, which eventually led them to conceptualize The Indian Handwritten Letter Company (TIHLC), which allows anyone to send high-quality handwritten personal letters to friends and family for various occasions, such as birthdays, return gifts, marriage invitations and more. We believe in crafting high-quality, personal letters that makes all the difference to those who receive them and those who send them, as receiving a letter is much more personal than opening an email. Knowing that someone has taken the trouble to put pen to paper will make you feel that the person cares about you. So instead of dashing off a quick email or facebook message or tweet to congratulate your friend or relative, you could send them a handwritten note instead. We love the feeling of touch but barely have time, so we will help you make your feelings flow through the pen and ship it. What the customer gets ? B2C – Helping people express to their loved ones on special occasions or any other thing. B2B – Helping corporate companies reach out to their customers in a very personal way, thus creating better recognition and recall and most importantly customer loyalty! We help you connect with your long distance friend once again personally, birthdays, return gifts, marriage invitations or your preferred customers. Call it old fashioned but we still think it’s pretty amazing when someone writes a letter, so we are here to make handwritten letters cool again! These days we seem to be plugged into everything. Hand-held devices to wifi platforms, everything is making it possible to stay connected everywhere we go. Whatsapp, Facebook, Twitter and texting have become the preferred method for keeping in touch with people. There is no doubt that it can be very stimulating to feel so connected and yet it can hardly be denied that there is a feeling of underlying emptiness. Somewhere we have lost something. The more plugged into things we get, the more disconnected from people and feelings we are. That’s why, we came up with the Indian Handwritten Letter Company where we could pen real letters for people with meaning on their behalf. Thus bringing back the value of vintage feelings and telling the person in front that you care a bit for them. We as a team believe that as people we should be alive in terms of what we do and give it our 100%. People love handwritten letters but the way everything has translated into digital its very difficult for people to get back this feeling and get people to write. We are constantly getting feedback from our customers who are using our services and this is helping us making the product and the process better. We are constantly on the lookout for people who have a passion for letter writing and somewhere we have been able to run operations smoothly. At this point of time, we all three founders have invested in our own capacity. We are still looking at clocking 6 more months of sales and then we would be looking for seed capital. May be its not a big problem for us at this time as our team is focussed and our passion for letter writing keeps us together. We three trust each other on the different roles and responsibilities that we take up. Thus it helps us run in different directions and implement our strengths in the best possible way. We need to stop ordering in desserts daily while working. Not wasting more time in thinking and executing it faster.